I got this recipe from one of my customers who made it at home! Add rinsed jackfruit, onion, garlic, cumin, bbq sauce, cloves and stock to a pot and cook for 5-10 minutes over medium heat, stirring occasionally. Using a potato masher or large fork, mash the jackfruit to create the "pulled meat" consistency. Add more water if necessary, cover and let simmer for 45 minutes over low heat, stirring occasionally. Stir in the drained beans. Cover and cook another 30 minutes. Keep warm until ready to serve. Meanwhile, in small bowl, whisk together the mayo, vinegar, lemon juice, and pepper. Put the cabbage in medium bowl and toss with the dressing to coat. Add a small dash of maple syrup if needed but be careful not to add much, as the jackfruit will be sweet from the BBQ sauce. 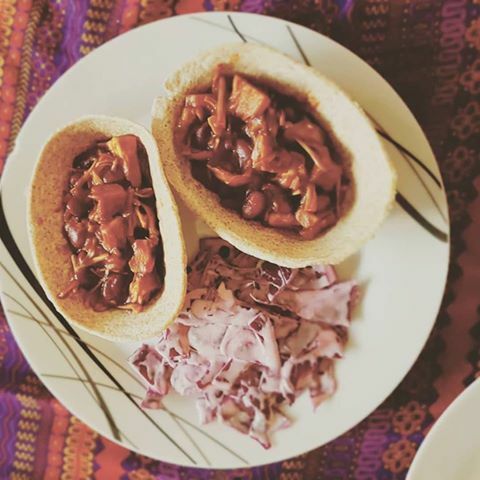 Serve the pulled jackfruit in tacos with the cabbage, and a choice of pickles like gherkins. This recipe should be gluten free, but always check labels if the products used are not listed on this website.